Yesterday I watched two very sad things on TV that I had recorded earlier. 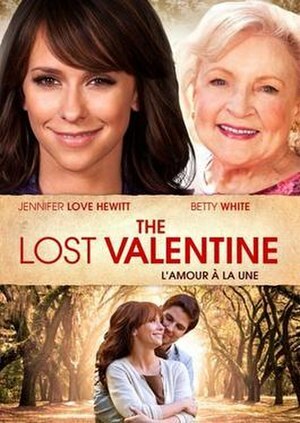 One was a movie I had seen a few years back starring Betty White called “The Lost Valentine“. Not sure if the movie is based in fact – but it could have been. The premise: A young married couple during WWII, the husband called away for duty. She gets a telegram saying her husband is missing in action. For over 60 years. A young female television reporter hears about the story and becomes curious. After interviewing the elderly woman who has never had any other word from her husband or the war department after that fateful day of the telegram, the young woman sets about to do some investigating. Through a series of events and a lot of digging she finds a man who was with the missing man in the jungle across the sea, during his last days. Through a Skype call to the widow – he is able to tell her what happened to her husband all those years ago. He was a hero. He could have come home – but wanted a man more seriously injured than himself to be allowed to go first. There was only room for one man. He stays and helps those men there in the jungle – gets caught in a cross-fire and is shot and killed. What a relief to finally hear. It’s the not knowing that will kill you. They confirm the remains of her husband and in true pomp “military style” they bring him home and parade him past his widow. That scene is very moving. I did not expect the flood of tears – but they came anyway. If that was not sad enough, last night we watched “Downton Abbey“. The episode was very sad as well. In the days before C-sections, mothers and babies were often lost due to serious complications. Seeing the youngest daughter die after delivering her baby with something called eclampsia from toxemia was very hard to watch. And might have been prevented if they had taken their doctor’s advice to have her moved to a hospital and have immediate removal of the baby. In the early part of the last century – it was not something that was done very often – and people simply did not trust hospitals because of sickness and possible infection. Oh my. Things that are prevented today with proper medication and hospitals. My own maternal grandmother lost her first baby while delivering at home and too far from a hospital when a serious issue came up. Today this would not have happened. I cried so much yesterday because of these two very sad things. Of course my lack of sleep (we have a new 5 month old puppy that we rescued) might have contributed to my general feeling of sadness. But I have heard that tears are healthy. It’s great to have a “good cry” once in a while. It resets the switches and cleans out the toxins. I have always wondered about this – as the only thing it seems to do for me is give me bags under my eyes and a whopping good headache! What about you? Ever had a good cleansing cry? Did you feel better or worse? Do you feel that it is healthier just getting it out? Not sure about me – but I have always been emotional and prone to tear up. Sometimes I wish this was not so – it tends to happen at the most undesirable times! Here’s hoping you have that good healthy release of emotions and toxins in your body today! Maybe a good cry? I trust you will be blessed and encouraged today with these three awesome people – and look up their blogs for more awesome articles! 2. I am thankful for my children who are young adults now with lives of their own – and who are finding their way and who both have a strong faith in God – and a great friendship with me and their Dad. 3. I am thankful for the opportunity to use my gifts everyday in music and I LOVE my students so much. 4. I am thankful for good friendships – both past and present and what I have learned from both – but especially the ones who stayed – you are the roots in my life. 6. I am thankful for my relationship with Jesus Christ – that started at a very young age. 8. I am thankful for like-minded believers at my church family – and especially my pastor Stephen and his wife Mandy. 16. I am thankful for my big screen TV for watching holiday movies and specials. 17. I am thankful for new facebook and blogging buddies – who have found a way of expressing ourselves that is quite unique to us. 18. I am thankful for a warm bed – with adjustable frame so I can sit up in bed and read or watch TV. 19. I am thankful that my husband still brings me a first cup of coffee in bed – after all these years. 20. I am thankful for all my readers. We are in a unique world of the written word – and if you have found yourself here – you know a little more about me than most folks – because this is where I live and express myself. It’s so great how the ‘lost’ can be ‘found’ – if you wait long enough. 25 years ago, Greg and I were youth pastors in Jeannette, PA. We had a small youth group – but with those eight or ten ‘kids’ we developed deep and lasting relationships – especially with four of the boys. They were and always will be ‘the lost boys’. This was my pet name for them – because each one had their own unique set of circumstances and challenging home lives. We came into their lives in that crucial part of life – when they were teenagers. You never know how you will affect lives while you are in the middle of your own journey – or what the future impact may be. We were just simply doing our job and it was easy to love these kids. And with no other distractions and no children of our own yet – they became our ‘children’. After moving away from Jeannette in ’86 – we took a position in New Castle, PA and two of the boys came to visit us. I was pregnant with Ashlee at the time and it was so great to see them! They told us of some trouble that one of the boys had found himself in – and we wanted to reconnect with him – even back then – but it was hard in those days with no internet. Sadly we lost touch with all of them and some time later moved back to the west coast. Because there was no internet yet – or at least very limited – I had no way of finding anyone – but always thought about them and wondered what had happened. The memory of my ‘lost boys’ was always on my mind. When we first had internet, back in the late 90’s I tried once more to locate them. Nothing. Years passed and I got on myspace and looked. Nothing. Then a few years later I got on facebook and tried again. No luck – until….about 6 or 8 months ago. I typed in two of the boys names and FOUND THEM!! It was like a miracle! I contacted them – one now lives back in Jeannette and the other is in the army and stationed in Afghanistan. What a thrill to talk to them and catch up on their lives – there’s a whole lot to catch up – 25 years! One of the ‘boys’ suggested that we use Skype to talk to each other using a webcam on the computer and seeing a real face in front of you while you’re talking. We had never used it before and after a lot of bugging on his part – Greg finally downloaded Skype. Last week we were able to call him. I can’t tell you how it felt to see him (this was the one that had some trouble in his teens after we left) and to see that he’s all right. During the conversation I said, ‘You know Randy – you were the original ‘lost boys’ – you were like our kids’ and without missing a beat he said, ‘Well in many ways – you were our parents’ That was so nice to hear. That ‘lost boy’ is 40 years old now. And he has never forgotten us. Two of the other boys were found from this blog. I wrote an article about a year ago – still looking for these ‘boys’ and wrote their names in an article hoping someone would see them. Someone did. One of the boys himself – who was not on facebook – was using ‘google’ to find another one of these boys and my blog popped up! He commented on the article and gave me his email. That was amazing too! He told me news of he and his brother and what a journey their lives had taken. Randy and I pushed and pleaded with him to join facebook – and he finally did! Here is a video I made for the four ‘lost boys’. This song has much meaning – it was an ’80’s tune that played on the radio ALL THE TIME back then and Bill use to ‘sing’ parts of it and make us all laugh. Good times, good times. Here’s hoping that whatever you have ‘lost’ – will someday be ‘found’. I had the strangest dream last night. And I think I know why – at least in part. Greg and I have been reconnecting with old friends on facebook – even had the privilege of talking on Skype to one of them last night whom we haven’t seen in 25 years. It brought up memories from the past and much conversation about ‘old times’. So my dream consisted of a pastor whom we used to serve along side – 25 years ago – In the dream – Greg and I were on the platform of a church with him on a Sunday morning. After song service Greg and I went to sit down – on the platform. It suddenly came to my attention that I was going to be singing a special number for the offering time. I was VERY aware that although I knew the song – I had NO IDEA what the words were – and had left my ‘cheat sheet’ downstairs. So I left my microphone on the chair – murmured something to Greg and went flying off the platform in search of the sheet of paper. When I got to the bottom of the stairs I couldn’t get past the nursery, the buffet luncheon and several other road blocks in my way. In fact the downstairs part of the church was now part church – part mega mall. All I wanted by now was just to find someone who would let me use their computer so I could ‘google’ the lyrics and then print them out. But I couldn’t find ANYONE who would help me! I knew that the pastor would be wondering where I was by now – and I was hoping he would just go on with the message – and if I came back – I would sing my song at the end of the service. Finally I found a man who said I could use his computer. I was outside now – following him to what appeared to be his office – only he went inside and came right back out and jumped into ‘his’ car. He beckoned to me to get in – then he jumped out and ran away. Another man came over with his car keys and opened up the trunk – I said, “What are you doing”? and he replied, ‘that man was stealing my car – all of this luggage is mine’ and he proceeded to pull out the suitcases and throw them on the ground. It was all very puzzling to me – all I wanted was to use a computer and print out MY WORDS for the song!!! Well needless to say – I didn’t get the words – at least I don’t think so – I woke up. And I guess I will never know about the two men in my dream either – dreams are funny like that. It reminded me of a very good movie I saw some years ago starring Robin Williams. His very best film in my opinion. And although you may disagree with the theology in this film – it is beautifully written and takes your imagination of the ‘after life’ – and a glimpse into what heaven and hell could be like – taking you on quite an adventure in the process. It is a love story – that transcends death – true ‘soul mates’ that manage to find each other even in death – after pain, sadness and desperation. I have included a video below of some of the scenes set to Elton John’s “The One” – probably my most favorite song of his. 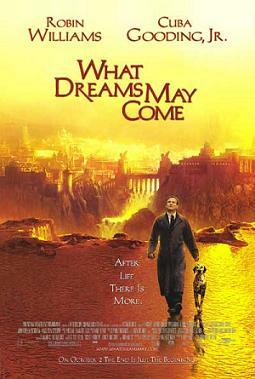 Don’t judge the film too harshly – it is written like a ‘dream’ in some parts – and it is someone’s interpretation of that dream and the ‘after life’. After all – sometimes – a dream is just a dream.